What are bunions? 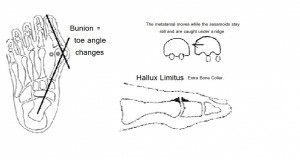 What is hallux limitus? What are bunions / hallux abducto-valgus / HAV? What is hallux limitus ? Bunion joints are essentially caused by a ‘looseness’ in the long bone that leads downhill to the base of the big toe, known as the 1st metatarsal. When this foot is placed on the ground, the 1st metatarsal goes into the ‘up’ position as shown in the previous FAQ. In this position, the big toe can’t pivot around the metatarsal head as it should, because the topside edges of the two bones jam into each other. You can see this on a normal foot, if you hold the 1st metatarsal in a down position and bend the toe, the motion is smooth and loose. With the bone pushed up, the motion is restricted and needs much more force to make the toe go around. This leads to a lot of rubbing inside the joint. Depending on the physical shape of the bones involved, the 1st metatarsal and the closer bone within the toe, it is this forceful grinding that will cause extra bone to develop around the joint as the bone strengthens under load. Under one set of circumstances, the bone bump grows out to the side, the 1st metatarsal bone starts to pivot away from the foot making it broader and the big toe crowds in towards the 2nd toe. This is called a bunion or hallux abducto-valgus or HAV. It can be painful although this is certainly not always the case. It can cause fitting problems, particularly with women’s fashion shoes. With some variation in the anatomy of the bones, the bone bump will grow like a collar around the topside surface of the big toe / 1st metatarsal joint. This will lead to a permanent decrease in how far the toe can bend up as you walk. This condition is called Hallux Limitus (HL) and, while it doesn’t look as troublesome as a bunion, it is often more debilitating over time. This condition can be associated with lower back pain and stress fractures to the forefoot. To view this Q&A session on bunions as a single document in downloadable / printable format, please browse to our Ball of the Foot Info Sheet. To learn more about our podiatry and orthotic services in Brisbane, Australia, please refer to https://walkwithoutpain.com.au. Use this link to return to more topics on the Podiatry FAQs Blog.